Sadhita and Sudaka run atleast two retreats a year in Dhanakosa and elsewhere. 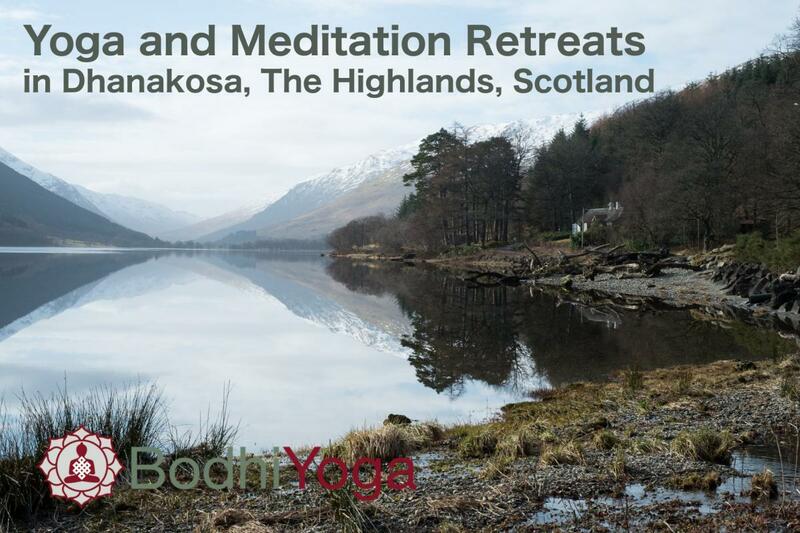 Dhanakosa in Scotland, on the shores of Loch Voil holds a special place in our hearts, as both of us have been teaching there for many years and Dhanakosa is where we regularly started teaching together in 2007, a couple of years after a fateful encounter in the Centre of India at Nagaloka. Dhanakosa became the birthplace of the Bodhiyoga project and we have met many of our teachers and friends through doing retreats there. The retreats we run are an ongoing exploration of the relationship between the yoga and Buddhist traditions, especially through the teaching of Mindfulness. For many years we have worked with the delightful Dharmacharini Amitashuri, a Scottish native, who lives and works in England. For our UK students Dhanakosa is realatively easy to get too with a train to Stirling. To book please contact them directly. Please book early as these often fill up. Our retreats at Suryavana unfold in two phases. A new development has been to invite locally based practitioners both English and Spanish to join us over the weekend. After Sunday lunch the Spanish group leaves and the retreat moves into a second phase with the smaller group emphasising more silence and contemplation. We offer two groups with meditation and Yoga classes in English and Spanish. This format has proved very satisfactory intercultural event. Places will be limited so book early. Mindfulness practice forms the basis of the practice. The retreats are open to all levels. We start from basics and build up over the week, exploring the fundamentals of practice. You will be carefully guided to help you establish confidence in your yoga and meditation. The retreats draw their inspiration from the Buddhist tradition. Led by Sadhita and Suḍāka, the founders of Bodhiyoga, you will leave our retreats clearer, stronger and more confident as to how to work effectively in yoga and meditation. Practicing in the context of a retreat provides ideal conditions to experience connect to deeper sources of inspiration. The delightful gently wild Mediterranean coutryside supports this process. The programme is designed to give plenty of time to be quiet, to rest, hang out with others, or go for walks. A special feature of the courses will be the afternoon sessions (17.00 – 20.00). We pick up the theme of Mindfulness and Yoga and explore this through Restorative Yin-style Yoga and meditation. As the retreat deepens we offer an extended one day practice of silence with an emphasis on more meditation practice in the format of "sesshins", a Zen or Chan style of practice whereby we alternate short periods of walking and sitting meditation. Silence throughout, support our retreats. The morning yoga will be stronger and more dynamic to energise and strengthen the body, the afternoon class will be gentler. Sadhita and Suḍāka alternate teaching sessions of yoga and meditation, so you will receive classes from both. Meditation sessions are combined with the yoga classes and we provide plenty of instruction on setting up a meditation practice, how to meditate and how to deepen your meditation practice. We draw strongly on the Satipatthana or Mindfulness - "Direct Path to Awakening" teaching from the Buddhist tradition. We teach the meditations of the Mindfulness of Breathing, Metta Bhavana and Just Sitting as well as how to practice and integrate "everyday Mindfulness" into your everyday life! The retreats have a limited number of places, so book early. Contact us via our email and send your full name, address, phone number(s) and emergency contact name and number as well as tell us a bit about your yoga and meditation experience. To reserve and secure your place send us the full non-returnable payment in British pounds sterling. Check that you will have adequate health insurance cover for the duration of your journey. Check that your arrival and leaving time allow time to get to and from the airport/Valencia train station. The Retreat Centre emphasizes ecological sustainablilty, simplicity and collective living. Electricity comes from solar panels. Filtered (no chemicals) drinking water is from local springs. There will be NO INTERNET! Suryavana is effectively off the grid! We ask participants to not use their phone unless for emergencies only. Sudaka and Sadhita teaching. Alen Ribera our chef! Having a healthy body is having a healthy mind. Caring for the food we eat is part of our practice to get the balance between the two things. Enjoying the colors, texture, aromas and flavors is one of the pleasures of life. And if we are also surrounded by nature, clean air and beauty, everything tastes better. I really like cooking in Suryavana, I have always enjoyed being there and I think the people that eat there enjoy it too! Please note that there will be no Internet available and it is preferable to not have your mobile device switched on during the course of the retreat. You can give Suḍāka's number 0034 638 31 71 38 to family and friends if there is need to contact you in an emergency. "Bodhiyoga retreats provide a mindfulness top-up. Sadhita and Sudaka compliment each others’ teaching styles and expertly weave traditional seated meditation instructions into yoga asana. These conditions, combined with Suryavana’s well-appointed facilities and delicious meals cooked by a skilled chef, enabled me to reconnect me with my heart and mind, on the cushion and on the mat." Suryadarshini, Norwich, U.K.
Suḍāka and Sadhita gave a really clear and excellent course in meditation and yoga that helped me deepen my practice in a way that I will take forward as part of my busy life in London! - Hugh Mouser, London. U.K.
Clarifying, reflective, supportive, comforting, relaxing, detoxifying, peaceful, emotional, space, heat, frustrating, rewarding, release, recommended, special, unique, returning. - Fiona Stiles, Wirral, UK. Sadhita and Suḍāka really know their stuff. Yoga is intensive and light, so is the meditation, teaching and guidance. A wholesome holiday! Fiona Kelk, London, U.K.